If having a lean and sculpted body is your goal then I’ve got good news for you: follow these 5 Workout Secrets and your goal will quickly become a reality. These secrets aren’t secret in the sense that you’ve never heard them before, because you likely have heard them. The secret is that by faithfully following each and every one of these 5 steps your progress will become automatic and your results will be guaranteed. If you want a fit body then exercise MUST be a consistent part of your life. You can’t exercise hard this week and then take the next two weeks off and expect to see results. Results come from consistency. Let’s be realistic here, you aren’t going to lose 20 pounds in a week. That’s not an attainable goal! Those who achieve the most amazing body transformations do so by reaching a series of progressive, attainable goals. If you would like help in determining what an appropriate, attainable goal would be for yourself then simply reach out to me, I’d be happy to help. Are you straining to include your chosen exercise routine into your life? If your exercise time isn’t a seamless part of your daily life, if it causes too much of a strain and headache to accomplish, then you won’t stick with it. Find a time, a place and a modality of exercise that is as convenient to your real life as possible, so that you can be faithful to Workout Secret #1 by staying consistent. Similar to Workout Secret #3, finding a modality of exercise that you LOVE is key to making this a permanent part of your life. You may never love swimming because you hate getting your ears wet, or you may never love biking because you’ve always struggled with balance. If you’re straining to get through a modality of exercise that you loathe, then you won’t stick with it. It’s best to move on to something different that you would enjoy more. **Note for exercise-haters: If deep down you consider yourself an exercise hater, then DO NOT take this Workout Secret as a free pass to forego exercise altogether under the guise of not loving it. Part of becoming fit for life is learning to find a type of exercise that you can learn to love. 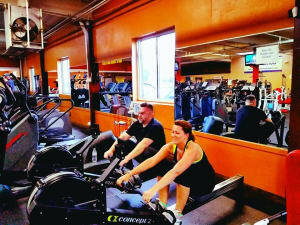 This is my favorite Workout Secret because this is where I get to work with you! 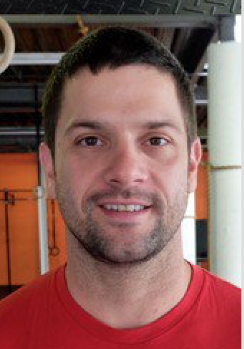 My passion and focus is in helping folks like yourself integrate fun, challenging, health-promoting exercise into your daily routine so that you reach your body and health transformation goals. Don’t wait another minute! Call or email me today to get started on your personal body transformation. Don’t underestimate the power of social accountability in your quest for a better body. Find a friend with similar goals and make a pact that you’ll hold each other accountable. No one likes letting down their friends, and so you’ll show up to your workouts day after day, week after week! Put rewards in place to enjoy together as you and your workout friend begin to reach your fitness goals. Here’s the perfect fresh salad to serve as a compliment to your next healthy stir-fry dinner. The dressing is simple to mix together at home and is filled with delicious Asian flavors like sesame and chili garlic. Use fresh organic spinach, radish and cucumber for the best flavor and highest nutritional value. Whisk the dressing ingredients in a small bowl. 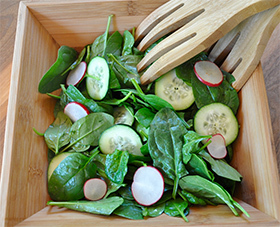 Combine the spinach, cucumber and radish in a salad bowl. Toss with the dressing and season with salt and pepper. Enjoy! Nutritional Analysis: One serving equals: 67 calories, 5g fat, 5g carbohydrate, 282mg sodium, 2g sugar, 2g fiber, and 2g protein.